Microsoft released -- the missing -- cumulative update KB4476976 for Windows 10 version 1809 and Server 2019 yesterday evening to the public. The company released cumulative updates for earlier versions of Windows 10 days ago but decided to test the update for Windows 10 version 1809 in the Release Preview ring before its official release. Microsoft changed its strategy in regards to cumulative update releases for the latest version of Windows 10 after the update fiasco of Windows 10 version 1809. Instead of releasing cumulative updates outright, like the company has done on older versions of Windows 10, it is pushing updates to the Release Preview ring first before releasing them. In other words, another round of testing and -- hopefully -- bug finding before the update is unleashed on the general population. 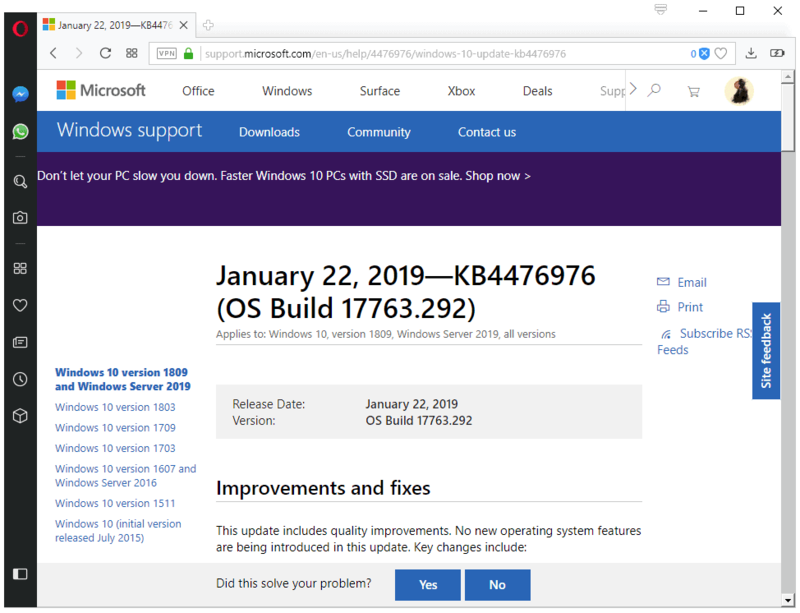 KB4476976 is available on Windows Update and as a direct download on the Microsoft Update Catalog website. Windows administrators who install the update manually need to make sure that the latest Servicing Stack Update is installed on the device. Microsoft Edge may stop working with "certain display drivers". Third-party applications having difficulties authenticating hotspots. Promotion of non-root domains failed with error "The replication operation encountered a database error". More Japanese era calendar fixes. Compatibility issues with AMD R600 and R700 displays. Audio compatibility issues with games that use 3D Spatial Audio Mode through multichannel audio devices or Windows Sonic for headphones. FLAC playback issue (could stop responding) when using operations such as rewind. The policy "Prevent users from uninstalling applications from Start Menu" did not work. File Explorer stopped working when enabling Timeline and the "Allow upload of user activities" policy was set to disabled. Local Experience Packs could not be downloaded from the Microsoft Store if the language was set as the active display language. Some symbols appeared in "a square box on a text control". Two-way audio issues during phone calls for some Bluetooth headsets. TCP Fast Open was turned off on "some systems". Some applications lost IPv4 connectivity if IPv6 was unbound. Connectivity issue on guest virtual machines on Windows Server 2019. Creation of page file on a drive with the FILE_PORTABLE_DEVICE flag caused "Windows created a temporary warning" errors. An issue in Windows Server 2019 that causes a Hyper-V VM to remain at the bootloader screen for OS selection when restarting the machine. Ltotape.sys update to add support for Linear Tape-Open 8 (LTO-8) tape drives. Microsoft Edge may not load resources using local IP addresses anymore. Workarounds available (Add local IP address to list of Trusted sites). Microsoft Jet Database issue that throws the error "Unrecognized Database Format". Workarounds are available. Now You: Did you install the update? Installed this morning, all fine here for the moment. Thanks @Martin. No, let MS perform first perform a proper test, and report on proper working, before I will give it a try. Ultimately, I may decide to install this update, a week before the next 2019April update is released, to prevent confusion with the next update. Checking for updates installed a .NET preview, but NOT the CU! Don’t knock Woody. He has no control over how MS updates function. If Microshaft did its job, there wouldn’t be all the problems with Windows. You should let WIndows look for updates on its own. Checking for updates marks you as a free beta tester. No more manually updates for main Windows 10 pro 1803 build 17134.523. Automatically otherwise the system today upgraded (Update) Silverlight (KB100347). This Silverlight upgrade/update did not change the build update number. But I have a concern because Microsoft is nog succeeding to upgrade there o.s. from the build 1803 to the build 1809 is this BSOD wise a problem? I mean the software from not Microsoft programs is updated to the build 1807 and because of this could this makes your build 1803 more crash? The update resets the toast modifications, so if you had disable, you have to reapply the fix. Today was the 3rd time Microsoft pushed KB4023057 to my Windows 10 1803. I just uninstall the current KB4023057 and install the new update. 1809 Enterprise and KB4476976 will crash DirectAccess connectivity. o connection at all. Removed KB and all was fine. Re-Installed this KB and loose DirectAccess connection. Twice same behavior. I’m on 17763.316 and still having the issue that causes some symbols to appear in a square box on a text control.